PILEJE LACTIBIANE IKI 30 BAGS x3g: Contains 4 probiotic ferments carefully selected to ensure good digestive health. 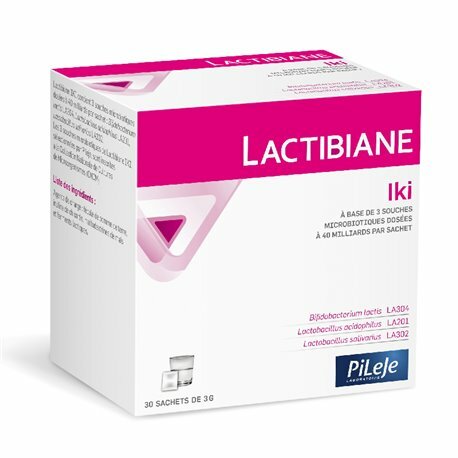 In some people, digestive disorders are very common and important: Laboratories Pileje provide them with the LACTIBIANE range LACTIBIANE IKI whose concentration probiotics can effectively relieve digestive disorders. 30 sachets Lactibiane Iki is a dietary supplement containing probiotics to improve digestive comfort and strengthen the intestinal flora. These are 3 different strains associated to restore the flora and the intestinal walls: Bifidobacterium lactis LA, Lactobacillus Acidophilus and Lactobacillus salivarius. Food Supplement LACTIBIANE IKI help people with digestive disorders important to find digestive comfort. During one month, dilute 1-2 sachets daily in a glass of water. Ingredients: Bulking agents: potato starch, inulin chicory, corn maltodextrin and silicon dioxide, lactic ferments. 3 probiotic strains concentrated to 40 billion per bag were selected specifically for enhanced cooperation on the microflora and the intestinal wall action.